Today’s guest(s): Fr. 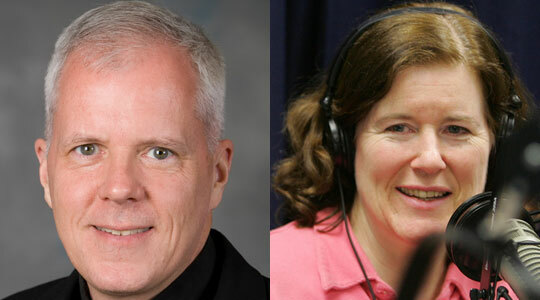 Richard Erikson, Vicar General and Moderator of the Curia for the Archdiocese of Boston, and Colbe Mazzarella, founder and organizer of the Way of the Cross for Life on Good Friday. A summary of today’s show: Fr. Erikson tells Scot and Fr. Mark what the vicar general and moderator of the curia does and then talks about the milestone of the Archdiocese’s balanced budget, which is a foundation for the future of the church in Boston. Colbe Mazzarella discusses her founding of the Way of the Cross for Life as a spiritual component of the pro-life movement. Then a discussion of the first Gospel for Palm Sunday. 1st segment: Scot welcomes Fr. Mark back to the show. Fr. Mark was in Washington DC with the Canon Law Society of America. He is a member of the board of governors. There are thousands of members. Tomorrow, as the judicial vicar, he is the chaplain of the Catholic Lawyers Guild, and on the Saturday before Palm Sunday they have a day of recollection. Fr. Ed Riley will lead the day. All Catholic Lawyers and judges are welcome at the Pastoral Center tomorrow. Scot asked why the annual Mass for lawyers is called the Red Mass. Fr. Mark said it has medieval origins. It connects with the robes that the priests wore during that Mass, which were red. 2nd segment: Scot and Fr. Mark welcome Fr. Richard Erikson to The Good Catholic Life. Scot asks what Fr. Richard’s job entails. He was asked by Cardinal Sean to take on the job five years ago and even then he didn’t have a full understanding. Vicar comes from the word vicarious. So his job is to take Cardinal Sean’s vision and make it reality. His job is to reflect the mind and the heart of the bishop. He said Cardinal Sean has an enormous mind and an enormous heart. He has the heart of a shepherd. There are a number of vicars general in the Archdiocese. The auxiliary bishops are also vicars general and Fr. Mark says that Fr. Rich’s role is unique because of his job as moderator of the curia. The curia are all those who work in the Archdiocese, those who work in the Pastoral Center and all the priests. He is the pastor for them. Fr. Mark asked what are the privileges of his role. Fr. Rich said he has the privilege of working in Christ’s name to bring Christ to others, to build the kingdom of God in the Archdiocese. It is also a responsibility of leadership as well. Scot said that on his first day of work, Fr. Rich talked with him about the ministry of development, and Fr. Rich talks about the ministry of administration. Fr. Rich is also an Air Force chaplain. What does it mean to have a ministry of administration? He says it’s difficult not to be a parish priest. He had imagined he would spend his life in parishes. Everything we do in the Pastoral Center i service to others, to parishes, to hospitals, to others in carrying out the mission of Christ. Even though he spends a lot of time in meetings and writing memos and looking at budgets, all of it is service to Christ and the Catholic community. Scot noted that he was astounded when he learned how big the Archdiocese is, how many ministries there are, how many organizations. Fr. Rich said what even more impressive than the scope of the operations is the dedication of the people on the staff and the hours people spend and the devotion and commitment. He didn’t know before he became vicar general that there are 144 communities in the archdiocese. His parish encompasses 1.8 million people. He’s learned that there are wonderful people who devote their lives to Christ and the Church with great sacrifice, day in and day out. It includes people who also work in administrative positions. Fr. Rich had enumerated four pillars he hoped that all ministries would embrace: Service, outreach, communication, and coordination. The most important person in the archdiocese today is the person who will ring a doorbell looking for a priest, a prisoner seeking ministry, a child receiving First Communion. In outreach, we are about what happens outside this building in the parishes of the archdiocese. Communication: To get the message of Christ, we make the best use, particularly through the Catholic Media secretariat using modern means. Coordination: The Archdiocese is very complex with a need for many different departments, like benefits, payroll, legal, etc., plus coordinating with the five regions of the archdiocese and all the vicariates and parishes within them. 3rd segment: For the first time in Cardinal Sean’s tenure, the Archdiocese has achieved a balanced budget for central ministries. Fr. Rich said its extraordinary given the challenges Cardinal Sean had. He began with a $15 million deficit. The Knights of Columbus had given loans to help, but the loans had up to $3 million in interest payments. To get here has required a great deal of sacrifice. First, there is the generosity of the people of the Archdiocese of Boston, sticking with the Church through the darkest hour of our history. Second, there is the great work of the staff in the Annual Catholic Appeal, which is to the archdiocese what the weekly offertory is to parishes. Third, the work of Jim McDonough, the chancellor, and his staff, bringing the best practices of finances and administration to the archdiocese. The sacrifices have included most painfully reductions in staff. The people in the Pastoral Center are doing more with less. Fr. Mark asked about future signs of hope. Fr. Rich said he sees the balanced budget is something to be built on. We have made remarkable strides in evangelization over the past few years through the Arise program and Catholics Come Home and the The Light Is On For You. These wouldn’t happen if we didn’t have our financial house in order and didn’t have t he generosity of our people. Scot said one of the headlines for him that he didn’t see in the secular coverage is the amount of information that’s there and how transparent there is. No other diocese comes close. Fr. Rich said trust is so important in a diocese so devastated by the abuse of minors and what the Church did not do in relation to those crimes. Transparency is one more indication of the Cardinal’s desire to earn the trust of the people of the Archdiocese. Fr. Mark said both the cardinal and the chancellor speak with optimism of the Improved Financial Relationship Model. Fr. Rich said Scot had the vision of a new relationship in terms of finances and stewardship between central ministries and the parishes of the archdiocese. Scot saw that the model for fundraising in the archdiocese needed improvement. The model is to increase offertory giving at the parish level—which has already seen great success—and then to have a fair share by each parish in its contributions to the central ministries. It’s not about increasing what central ministries receives. It’s about dividing the pie more fairly. It’s not about money, but it’s about relationships. The 30 parishes in the first phase have a far greater connection to central ministries and far greater sense of the Universal Church. Fr. Rich has written about Holy Week in the Pilot this week. It’s about Palm Sunday. As a priest he looks forward to next week for the opportunity to focus on our journey with Christ. The article looks at the Passion of the Lord and the fact that the Lord is with us. He encourages everyone to make the time to be with Christ next week. 4th segment: Scot and Fr. Mark are joined by Colbe Mazzarella. She started the Way of the Cross for Life. Back in the 80s she heard about a Walk for Life on the West Coast and 24 years later it continues. There are three processions: one in Boston with Cardinal Sean; another in East Boston; and the original that used to start in Brookline. they used to walk between three different abortion clinics, but they’ve all since closed. That procession is now in Allston in front of Planned Parenthood. They all start at 9am. The Boston route starts at Government Center and all the stops are at churches. The Paulist Center is next to the State House, St. Anthony Shrine, St. James in Chinatown, and Holy Cross Cathedral. They saw two stations per stop and do readings. This is not a protest. There are no signs or anything. They carry a cross and a statue of Our Lady. Fr. Mark said when he did this in Rome, there is something invigorating about crossing the street with a big crowd of people witnessing to Christ. Colbe said it’s about making reparation, like Jesus walking through the streets of Jerusalem, getting mixed reactions, being a witness. East Boston starts at Most Holy Redeemer. The Allston way stays in front of Planned Parenthood. The East Boston procession ends at the Madonna shrine in Orient Heights. At the cathedral, Cardinal Sean leads the last two stations and leads a consecration to the Immaculate Heart of Mary. The procession at the cathedral ends at noon and people usually stay for Good Friday services. Scot asked about the pro-life movement not being just about politics, but is about prayer and sacrifice as well. Colbe said politics is a means to an end. They’re trying to help mothers and fathers and babies live a good life and end up in heaven. They’re concentrating on the spiritual side of things. On Good Friday, Christ is pierced for what we do wrong. It’s not just about women who’ve had abortions, but for all of us who may have failed to help someone in a crisis pregnancy or otherwise were silent. It has the spiritual goal to be in union with God. Christ asked us to take up His cross and follow Him. Fr. Mark noted that Colbe has eight children. This is a family friendly event. They take two hours to walk what would normally take 20 minutes. There are people with strollers and others walking with a cane. Scot asked how people could do something like this in their town? She said they’ve had others who’ve done Ways of the Cross for Life as far as India. She has a booklet that she can send or email anyone. Email her at ccmaz@aol.com. Colbe said that after 24 of these Ways of the Cross for Life, she knows that she has served Christ. It’s not a great burden to organize it. Pick a time or place and invite others. Emphasis is on prayer, not on confrontation. 5th segment: Scot, Fr. Mark, and Colbe consider the Gospel for Sunday. Because the Palm Sunday includes all of the Passion which is very long, they will consider the first Gospel that is read at the beginning of Mass. Colbe says she loves that we are in different roles within the crowd of different roles at different times in our lives. Scot said that in the Holy Father’s new book, Jesus of Nazareth: Holy Week: From the Entrance Into Jerusalem To The Resurrection, he dictates it to the entrance to Jerusalem. He says hosanna is understood that it is connected to the coming of the king. Blessed is he who comes in the name of the Lord would fulfill the messianic promises. Kings of the day controlled the means of transportation. The people understand that Christ at least believes he is the new king, but he is a king unlike what they were expecting, a king of peace, of simplicity, of the poor. Fr. Mark said they were ready to cheer the king they thought he was, but they abandoned him when he wasn’t what they thought. The Holy Father also says the Palm Sunday is an anticipation of what the Church does each day in her liturgy. The Church sees the coming of Christ again and again in the bread and wine. The Church greets Him as one who continues to come. As a pilgrim, He comes to us and take us in His ascent to the cross and resurrection to the New Jerusalem. Fr. Mark said it is a perfect time to come home to the Church, to walk with Christ into the glories of Jerusalem. Don’t wait for Easter. Come Palm Sunday with us on the journey.